Plenty of Plastic to clean up after my Pouch. When the City of Davis was considering banning the distribution of single-use plastic bags by retailers, one concern that came up over and over again from dog owners was what would they use to clean up after canine companion. I thought of this today, almost 7 months after the plastic bag ordinance was put into effect, as I was trying to stuff another bag into my already full nylon bag holder, where I store bags for use on the walks I take with 75 pound labradoodle. If not the single use variety what’s filling up my bag holder? 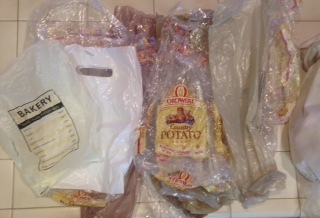 There is the plastic bags that my son’s favorite bread comes in, as well as the ones the poppyseed bagels he loves come in. There are also the bags that protect my newspaper on rainy days, and ones that I occasionally put produce in when I forget my usable ones. So fellow dog owner living in single use plastic bag free zones, take heart, there are alternatives for cleaning up after your best friend.